Who, upon seeing a cake in the office break room, says, “For whom is this cake?” instead of “Who’s the cake for?” Where did this rule come from? The answer will surprise even most English teachers: John Dryden, the seventeenth-century poet less well known as an early, influential stickler. In a 1672 essay, he criticized his literary predecessor Ben Jonson for writing “The bodies that these souls were frightened from.” Why the prepositional bee in Dryden’s syntactical bonnet? This pseudo-rule probably springs from the same source many others do: the classical languages. Dryden said he liked to compose in Latin and translate into English, as he valued the precision and clarity he believed Latin required of writers. The prepositionnal construction is impossible in Latin. Hence: it is impossible in English. Confused by his logic? Linguists remain so to this day. But once Dryden proclaimed the rule, it made its way into the first generation of English usage books roughly a century later and thence into the minds of two hundred years of English teachers and copy editors. The rule has no basis in clarity (“Who’s that cake for?” is perfectly clear); history (it was made up from whole cloth); literary tradition (Shakespeare, Jane Austen, Samuel Johnson, Lord Byron, Henry Adams, Lewis Carroll, James Joyce, and dozens of other great writers have violated it); or purity (it isn’t native to English but probably stolen from Latin; clause-final prepositions exist in English’s cousin languages such as Danish and Icelandic). Many people know that the Dryden rule is nonsense. From the great usage-book writer Henry Fowler in the early twentieth century, usage experts began to caution readers to ignore it. The New York Times outs it. The “rule” should be put to death, but it may never be. Even those who know it is ridiculous observe it for fear of annoying others. An interesting case is reported by Eagleson in Gibbons (1994), which involved a ‘farewell letter’, apparently written by a woman who had left her husband, but who in fact had been murdered by him. The letter was compared with a sample of her previous writings and a similar corpus of those of her husband. Eagleson concluded that the letter had been written by the husband of the missing woman, and when presented with this compelling evidence the husband confessed to having written it himself and to the murder. 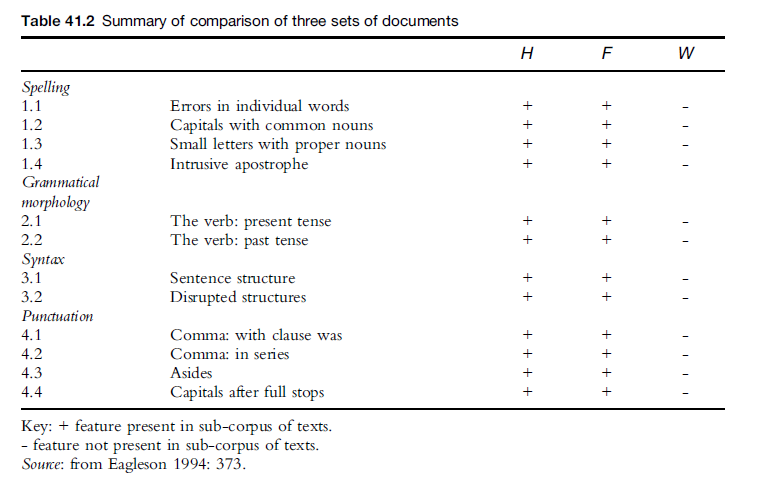 The features identified by Eagleson in both the disputed letter and the husband’s corpus of texts included marked themes, the deletion of prepositions and the misuse of apostrophes, as well as grammatical features such as omissions in the present tense inflections and in the weak past tense ending -ed. Table 41.2 is a summary of Eagleson’s analysis: H represents the husband’s corpus, F equals the farewell letter of disputed authorship, and W indicates the wife’s set of texts. While the majority of forensic work does not yield such startlingly neat results, Table 41.2 gives an indication of the power of using corpora to analyse texts of this type. Had these personal comparative corpora not existed or not been analysed, it is unlikely that the killer would have confessed since he had denied any involvement in his wife’s disappearance until he was presented with the parallel corpora evidence. It is not only the use of large corpora such as COBUILD or the British National Corpus which enables forensic linguists to contribute to casework. The internet is increasingly being used as a resource for linguistic analysis, although there are certain caveats which need to be applied to its use. While it is natural today to take ‘corpus linguistics’ to mean ‘electronic corpus linguistics’, we must not forget that there were language corpora BC, i.e. ‘before computers’. Случаи, когда какое-то слово оказывается запрещенным к употреблению, есть […] в языках всего мира. Особенно известны они на примере Австралии и Океании, откуда пришло и само слово табу , обозначающее такие явления. Скажем, в языке Западной пустыни – одном из крупнейших языков аборигенов Австралии – запрещено произносить слова, похожие на имена недавно умерших людей, что приводит к лексическим заменам. Например, в одном из диалектов после смерти человека по имени Ngayunya пришлось заменить местоимение ‘я’, звучавшее как ngayu, на ngankyu. Правда, потом и это слово подверглось табуизации, но тут на помощь пришел английский язык, из которого было заимствовано слово mi, а из других диалектов вернулось слово ngayu , запрет на которое тем временем ослаб — слишком уж давно умер Нгаюня. “Собственно говоря, борьба за звони́т – это типичнейший пример попытки остановить время. Многие другие глаголы проделали аналогичный путь почти незаметно, не вызывая бурного общественного возмущения. В XIX в. говорили кури́т (Он сладко ест, и пьет, и спит, / Кури́т и весь свой век зевает у Державина), вари́т (Увы, никто в моей родне / Не шьет мне даром фраков модных / И не вари́т обеда мне у Пушкина), подари́т (Посмотрит – рублем подари́т! у Некрасова). О людях-придурках магических ритуалах, правильных названиях, блестящей монополии и о том, что следовало переназвать птицу, когда Гоголь умер. [Tarahumara] are said to use the same word for “dancing” and for “working”—obviously because the distinction between these two activities is not immediately apparent to them, since in their scheme of things dance and agriculture serve essentially the same purpose of providing the means of livelihood. The growth and prosperity of their crops seems to them to depend as much or more on the correct performance of their dances, their magical and religious ceremonies, than on prompt and proper attention to the soil. In the Kate language, which is current in New Guinea, there is a word bilin, which denotes a certain kind of grass with tough stems and roots that are wedged firmly in the soil; the latter are said to hold the earth together during earthquakes, so that it does not break apart. When nails were first introduced by Europeans, and when their use became popularly known, the natives applied this word to them—as also to wire and to iron rods, in short, to everything that served the purpose of holding things together. Georg von der Gabelentz, in his book on the science of language, mentions the edict of a Chinese emperor of the third century B.C., whereby a pronoun in the first person, that had been legitimately in popular use, was henceforth reserved to him alone. The dead may, at any moment, be literally “invoked,” the moment those who survive him speak his name. As everyone knows, the fear of such visitation has led many savages to avoid not only every mention of the departed, whose name is tabooed, but even the enunciation of all assonances to his name. Often, for instance, an animal species whose name a defunct person had borne has to be given a different appellation, lest the dead man be inadvertently called upon by speaking of the beast.” In many cases procedures of this sort, entirely mythic in their motivation, have had a radical influence on language, and modified vocabularies considerably. Как у людей, у птиц одного вида могут быть разные “диалекты”. У живущей в Калифорнии белоголовой овсянки они различаются настолько, что человек с натренированным ухом мог бы с завязанными глазами определить, в какой части штата он находится, просто слушая пение птиц. As with humans, the song of a single species of bird may have different but related ‘dialects’. The white-crowned sparrow, a Californian resident, has dialects so different, even within the San Francisco area, that ‘someone with a cultivated ear would be able to tell where he or she was in California, blindfolded, simply by listening to their songs’ (Marler 1991b: 38). The Seeds of Speech: Language Origin and Evolution (Jean Aitchison).